Even the boisterous support of the local faithful was not enough to spur the Solomon Warriors to a dream debut win despite their confidence and control on the park. Several misfired opportunities will be rued as Brendan Chrichton’s men succumb to the experience and patience of the visiting side. “Obviously the result is not what we want but I felt that the boys played well today and in the end it came down to who took their chances,” says the former Nelson Suburbs manager. His counterpart, Richard Iwai, had more than one reason to be happy with the result since the victory also gives Amicale its first triumph at Lawson Tama stadium. “We came across expecting Solomon Warriors to be tough and today was a fifty-fifty match so am pleased that we are the winning side at fulltime. It is extra special because it is the first time for Amicale to win in here at Lawson Tama – a milestone for our club,” Iwai says. As expected Amicale started the better but Solomon Warriors eased into the game to make their presence felt. Key in the Solomon Warriors attack was inspirational captain, Judd Molea, who controlled operations from the centre. Just before the 20th minute Molea set up two great scoring chances but the massively experienced Chikau Mansale denied Solomon Warriors on both occasions. The home side received a blow when Sam Ayers, who had been industrious for them on the right wing, was taken off the field with a gash to the forehead. This forced Solomon Warriors to bring on Dennis Ifunaoa who was more of a striker player than a winger. Ayers’ removal was a major relief for Amicale who had struggled with his pace in the opening minutes. However, it was Solomon Warriors who came out firing with worthy chances falling to Moffat Kilifa and Brian Kaltack just before halftime. The second half brought back a more composed Amicale side which could start feeling that the momentum was going their way when Alphonse Bong was found inside the Solomon Warriors unmarked by Daniel Natou but the former could not finish. Fenedy Masauvakalo, however, did not make the same mistake from a dead ball situation just minutes later. His shot miraculously found its way past the legs of the defenders and into the back of the net past Eddie Newman’s scrambling effort. Solomon Warriors regathered and took the game to Amicale as Ifunaoa went firing with a shot on goal but Mansale again made another good save. However, Solomon Warriors’ best chance of the game fell to Kidston Billy in the 72nd minute but his shot, taken with the keeper already beaten, went wide. Amicale, however, kept their calm and went on the attack again in search of the buffer goal. This came in the form a penalty kick when Hadisi Aengari fouled Aliou Traore in the box. 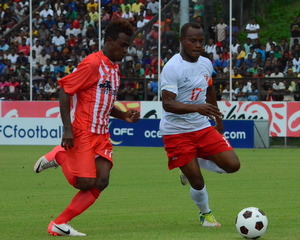 Papa Gueye stood up to take the kick and slotted the ball past Newman to make it 2-0 in favour of the Vanuatuan side. After the second goal, Amicale fell back to a defensive formation and allowed Solomon Warriors to play with the ball in their own half while checking them when they moved forward. With the final whistle came disappointment and frustration for fans who had hoped their club would get off to a fairytale start with a win. However, a chance to see if fortunes have changed is less than a week away when Solomon Warriors host Ba of Fiji on Wednesday 3 April.